2 drawings on paper, laminated (1 sheet) : ink ; left image 3.875 x 3 in., right image 3.875 x 3 in., on sheet 6 x 9.5 in. 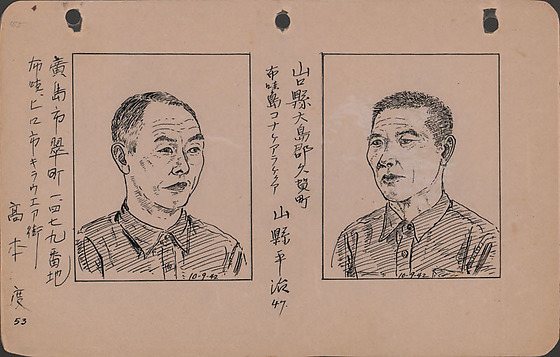 Ink portraits of two men, Wataru Takamoto and Heiji Yamagata, at Lordsburg Justice Department Camp, New Mexico on October 9, 1942. Both drawings have black line borders drawn over pencil lines. Left portrait of Wataru Takamoto, 53 year-old Hilo, Hawaii resident, originally from Hiroshima, Japan. Takamoto is turned slightly to the right and looks to right of viewer. He is clean shaven and is dressed in a dark button-down shirt that is buttoned at top. Visible from shoulders up. Right portrait of Heiji Yamagata, 47 year-old Kealakekua, Hawaii resident, originally from Yamaguchi, Japan. Yamagata is turned slightly to the left and looks to left of viewer. He is clean shaven and is dressed in a dark button-down shirt that is buttoned at top. Visible from shoulders up. Written in black ink to left of left image (In Japanese): Hiroshimashi Midorimachi 1479 banchi / Hawai Hiroshi Kiraueagai / Takamoto Wataru 53. Written in black ink to left of right image (In Japanese): Yamaguchiken Oshimagun Kugamachi / Hawai to Kona Kearakekua / Yamagata Heiji 47. Written in pencil, top left corner: 155.